NOTE: The following photos belong the Walt Disney Co. and can be found on their official Flickr page. The Orlando Theme Park News website is not associated with (or part of) The Walt Disney Company. Be sure to visit the official Flickr page of Disney/ABC Television for even more photos of this event. And that is all for now. We will continue to keep you updated in regards to any announcements that may be made during the event. We sincerely hope that there will be a lot of news to report this year! PHOTOS: ©2015 Disney. All Rights Reserved. That is one huge model. It looks nice, a lot of rockwork, waterfalls and plants. Just like the rest of AK but I don't feel this is Pandora or has anything with Avatar to do. Very nice of Disney to remind us of all the great stuff China is getting while disappointing us with James Cameron's AVATAR. 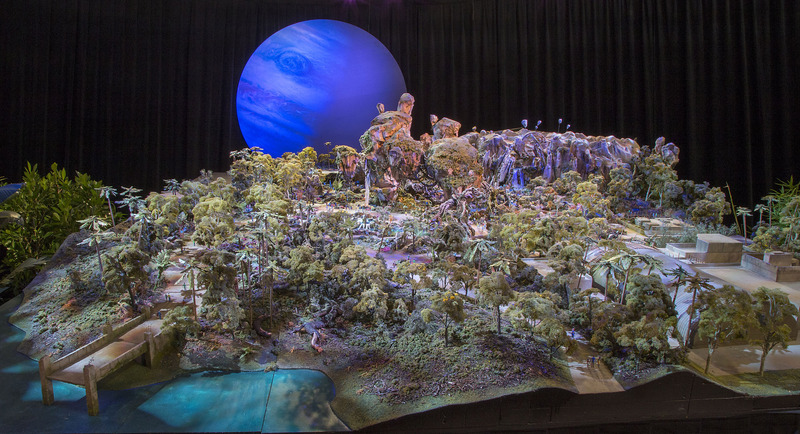 If they are building that huge metal structure at animal kingdom at the moment, where is that in this model design? I can't see anything that could possible be the huge metal structure, as I assumed it was going to be the tree, which is the main part of the films :s any ideas? Darren, the large metal structures are the formations for the rock work and floating mountains..
And the show building of course for the ride. Thanks Jon - can't believe I missed that in the model! Nothing in that model screams AVATAR to me. It looks like some nice rock work and a TON of plants/trees. It literately could be a section of land from anywhere in the current park. A bunch of trees and some rock work. There are a couple of small buildings shown but it is not clear if those will be for guest use or not. The whole land looks more like it should be called "Nature Land" or "Foliage Land". That was always going to be the problem too. They picked a movie that was "big" to combat HP. Except, they picked a "big" movie that didn't have any major iconic set pieces. The iconic element of that movie was the creatures and the way the world glowed at night. With HP, the locations are just as iconic as the characters. Heck, Hogwarts castle is one of the most iconic and most used locations in movie history. When you see a picture of that castle in a photo, you know instantly it is Hogwarts. If you see some plants and rock work with waterfalls, it could be almost anything. It's a real shame that so much time and effort has gone into this because it looks like nothing special. A revamped version of Soarin is not new and exciting enough to justify the cost of creating this whole land. Time will tell how this works out for Disney but I already know that this land is not going to be racking in the money like HP does. I am not impressed with the Avatar model. Enough said. lol yall trippin. Its just a model of the land/layout. There will be more details in the actual thing.